It is rare for me to find a restaurant or a hotel where I feel confident ordering directly off the menu. I usually have a million modifications to make to every dish. I do not mind asking questions and making special requests if it means I am going to get a meal I love. But sometime it is nice to have a break and simply order. While we were at Parrot Cay I was fully confident ordering directly from the menu with ease. Every dish was loaded with vegetables and greens. It was truly paradise. That is not to say I didn't come up with a few custom creations for them! Waiting for us in our room were water bottles that we could use during our stay. All around the resort were water stations so I had no trouble filling my bottle constantly. It's so important to stay hydrated in the sun! I started everyday with two "Kryptonite" green juices. On the menu this juice includes apple but I asked them to leave it out as I do not like fruit in my green juice. What made this juice truly delicious and special was the addition of fennel and spirulina. Such a different taste! I have to remember to try adding fennel the next time I make my own juice at home. Ok, let's be honest. I need to find a pressed green juice that includes fennel. My poor juicer gets no attention! At home I usually have a smoothie for lunch. This is a practice I tend to give up on vacation as a good green smoothie can be hard to find. However, while browsing the menu at the pool the first day I noticed that they had all of my favorite green smoothie ingredients (including fresh raw coconut water!). I tried my luck and asked the waiter for a smoothie with coconut water, spinach, avocado, cucumber and pineapple. At first he looked at me like I was nut. Then I said, " trust me, just ask the chef to throw all those things in the blender." Again he looked at me like I was crazy but off he went to place my order. I received a delicious smoothie that was exactly the light lunch I was looking for. I proceeded to order one every day! Funny side note: they didn't know how to charge me for this concoction so the bill simply said "Healthy Drink." Our first night at dinner I decided to go all raw. It is so rare that I get to eat raw food on vacation! I started with a raw corn taco with guacamole and cashew sour cream. It was truly delicious and reminded me of the raw tacos at One Lucky Duck that I adore. Next I had the "Big Salad." What can I say about the Big Salad? It is perfection in a bowl. Simply the Best. Salad. Ever. 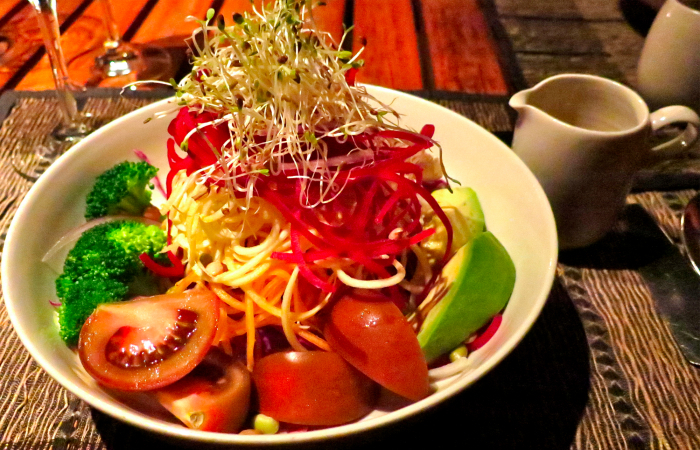 Shredded red and white cabbage, spiralized beets and carrots, sprouts, broccoli, mushrooms, avocado, and tomatoes in an apple cider vinaigrette. I became so obsessed with this salad that I ordered it at every diner. I have already begun to plot making my own version at home! Next time I will share some of the delicious desserts I enjoyed as well I what I took to eat on the plane home. Yum!